With nearly 7000 deliveries a year, the Carolinas Medical Center Maternity Care Center in house staff of perinatologist, neonatalogists, neonatal nurse practitioners and anesthesiologists are present 24 hours a day to assist with any delivery. CMC is the regional perinatal center and offers a wide variety of services including reproductive endocrinology, maternal fetal medicine, gynecology oncology and diabetes care. Carolinas Medical Center is the Regional Perinatal Center, with the largest neonatal intensive care nursery in the Carolinas, as well as the only ECMO (heart/lung respiratory assistance) system in the region. The Maternity Center at CMC offers family-centered care, allowing mothers and babies to remain in the same room throughout their stay. The center also features a new waiting room designed for family members and other guests, including small children, offering internet access and kid-friendly activities, 23 labor suites with state-of-the-art monitoring equipment and five rooms with Jacuzzi tubs to assist mothers who are having difficulty with labor. The specialists at CMC Women's Institute Center for Maternal and Fetal Care provide state-of-the-art care for women with high-risk pregnancies. Women with a history of a complicated pregnancy or women who are currently experiencing medical complications in pregnancy can receive ongoing care and management through this program. For women with high-risk pregnancies that may require fetal surgery or other highly specialized care, Charlotte Fetal Care Center is available to help ensure the health of both mother and baby. 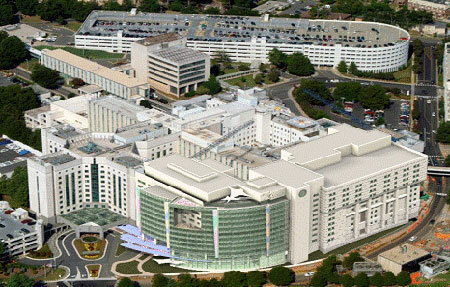 Charlotte Fetal Care Center is one of the few comprehensive fetal care programs in the region. The Charlotte Fetal Care Center and our Maternal and Fetal Medicine physicians have a close partnership with many of the pediatric and neonatal specialists at Levine Children’s Hospital. Learn more.